After being interviewed as a guest on two radio programs back-to-back, I was angry and frustrated. I had to endure radio talk show hosts and callers who have never attended a tea party, tell me how racist the rallies are. Not only will this false accusation of racism not go away, it appears to be growing stronger. Angry callers said they saw racist signs on TV and shared stories from black friends who claimed to have experienced racism at tea parties. I told one caller, "Ma'am, with all do respect, your friend is a liar." 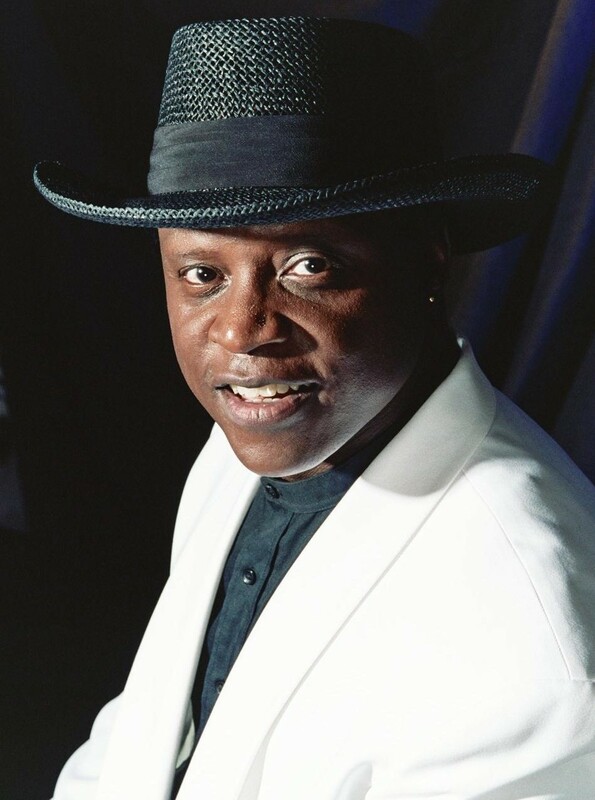 I am a black man who has attended well over 200 tea parties across America traveling on three Tea Party Express tours. I know the tone of the rallies and the types of people who attend them. The tea party attendees are moms, dads, kids, grandparents and yes, mostly white, but they are not racist. Many even voted for Obama. They are decent hard working Americans who love their country and do not want it "transformed" into Europe. For the ga-zillionth time, I will state this truth, the tea parties are not about race! So how has the "tea parties are racist" lie become so solidly branded into the minds of many? Then, it hit me. "It's the media, stupid." Last year I appeared on CNN fielding accusations that the tea parties are racist gatherings. During my interview, CNN showed the same sign of Obama as a witch doctor several times. (http://www.youtube.com/watch?v=_bLq3vvdGvM) Meanwhile, 99.9% of the signs on display at the rallies expressed opposition to Obama's policies only. The liberal mainstream media attempts to put and keep us tea party patriots on the defensive. They scream, "You should denounce those people carrying racist signs." Well, who died and made the "agenda driven" liberal mainstream media the final authority on what is racist? According to them, anything short of fawning approval of Obama is racist. The liberal mainstream media's hypocrisy is stunning. While chiding us to denounce questionable racist signs, they clearly favor and hide real hatred and violence coming from the left. A few years ago, after performing at a troop support rally in Washington DC, I walked a few blocks away to witness a so-called "peace" rally by the left. At least 1200 peace protesters marched down the street chanting, "F--- George Bush, F--- George Bush!" Their signs spewed hatred for Bush, our troops and America. And yet, not one sign or footage of the "peace rally" was featured in the liberal mainstream media. 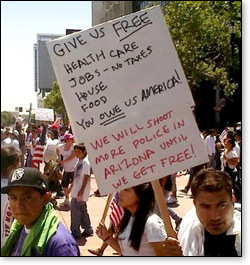 More recently, signs at Arizona Immigration Law protest rallies which threatened to "shoot more police" and other hate-filled anti-America messages are ignored by the liberal mainstream media. As I stated, I know the caliber of the patriots who attend the tea parties. If anyone displayed a truly racist sign or made a racist comment, that person would be verbally attacked by the crowd. Again, I say charges that the movement is racist are absurd. Here are a few of my personal tea party experiences. Keep in mind, I have performed at well over two hundred tea parties across America. Before singing my "American Tea Party Anthem," I say, "Hello my fellow patriots! I am not an African American! I am Lloyd Marcus, AMERCIAN!" The crowds go wild. Many tearfully thank me. They say hyphenating divides us. Would racists make such a statement? 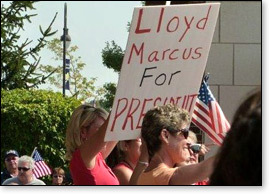 I've seen numerous signs in the crowds which read, "Lloyd Marcus for President." Why didn't CNN show any of those signs on TV during my interview? At a tea party in Texas, a white cowboy approached me pushing a stroller with two black babies. The proud new dad said he and his wife, who was also white, asked God to give them babies who needed their love. They felt blessed to adopt two babies from Africa. Could this couple be classified as redneck racists protesting Obama because he is black? An incident happened at a tea party in Traverse City Michigan which ripped my heart out. A white woman in a wheel chair saw me approaching. She yelled, "Oh my gosh, it is Lloyd Marcus. I listen to your music. I read your columns. I love you. May I have a picture with you?" The woman's adult daughter confided to one of our staff members, "My mom is dying. She said all she wanted to do is meet Lloyd Marcus." WOW! Now, do you understand why I am so outraged when the liberal mainstream media and ill-informed radio talk show callers attempt to portray the tea party folks as a bunch of racists? On numerous occasions, I have been approached at tea parties by patriots who have emotionally thanked me for my participation in the movement. Because we share values and principles, they call me brother. The "racist" accusation is an evil lie designed to control and shut up decent people who simply disagree with our president's agenda. White racist skin heads do not care if you call them racist. They probably wear it as a badge of honor. But, the decent white folks who attend the tea parties are devastated by such charges. Partners with the liberal mainstream media spreading the "lie" about the tea parties are Hollywood and the liberal democrats. Here is a shameful misrepresentation of the tea party patriots by NAACP president, Ben Jealous, "A group of White males wealthier than their peers called the Tea Party has risen up in the land. They say that they want to take the country back. And take it back they surely will. They will take it back to 1963 if we let them." As long as God gives me strength, I will keep shouting from the roof tops, "The Tea Party Movement is not Racist!" God bless.